It's Easter - the official harbinger of rebirth and renewal. Nothing speaks more to new opportunities for growth and happiness in our lives and that calls for a happy song indeed. For today's Music Sunday post, please allow me to introduce you to a new release from Michael Bublé, "It's a Beautiful Day." I hope that you make every day a beautiful day. Tomorrow is Easter. 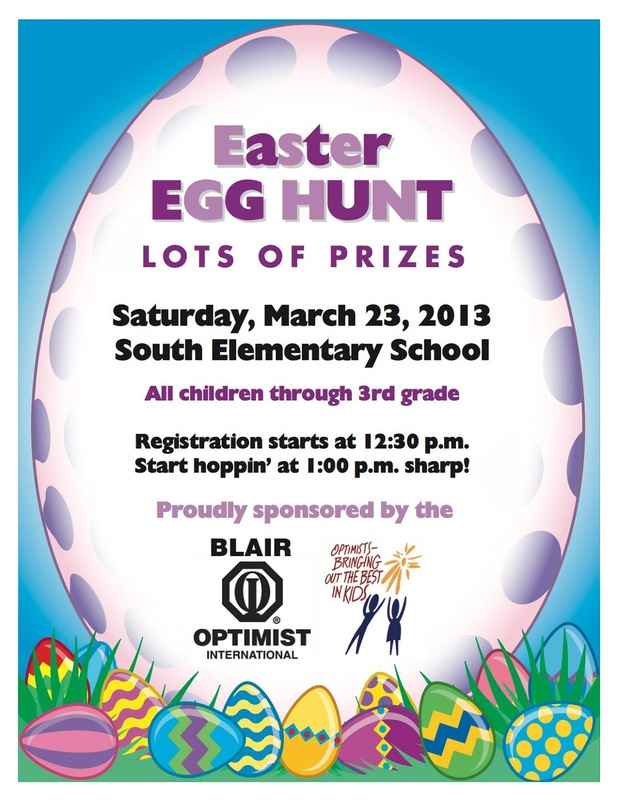 That means today, Optimists Clubs throughout the United States are hosting Easter Egg Hunts for the kiddos. It's the most fun that anyone can have in 2 minutes or less. 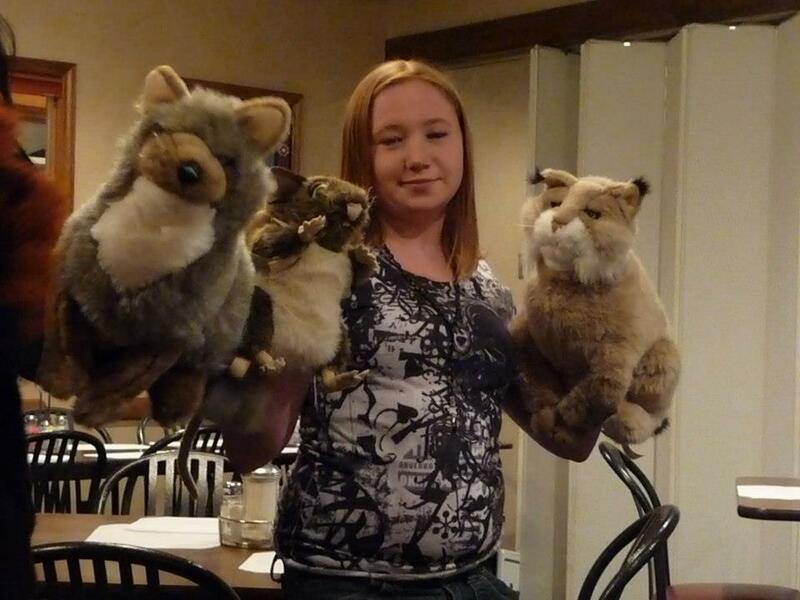 Here's a look at some of the fun with the Optimist Club of Jerome, Idaho. Happy Easter! 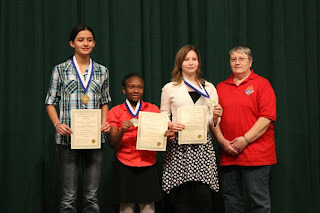 Thirty-two students participated in the Prior Lake Optimist Club Oratorical Contest. I think that is awesome! Prior Lake, Minnesota is a community approximately 20 miles southwest of St. Paul with a population of approximately 23,000 people. I've heard of much larger communities that have trouble getting three or four students to participate in the Optimist International Oratorical Contest. Teachers and advisors often say that the students are too busy or that the award ($2,500) isn't enough to inspire their students. I think that as Optimist Clubs we need to be more inspirational on our own. We need to appeal to the students where they are most likely to notice. Facebook and Twitter must be in the mix, and for the greatest appeal, head on over to YouTube and upload a video that makes the contest look fun. Talking heads droning on about "Why my voice is important" is not fun. But short snippets from students, filmed at locations that matter to them, might be. Use your imagination, be creative and inviting, and you'll find that students are more interested in your program. 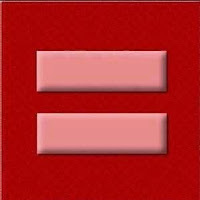 I haven't weighed in on Twitter or Facebook with my opinion about gay marriage by changing my avatar, but to be absolutely clear, I support it and I always have. Does a post about gay marriage belong on this blog? Some would debate that it does not, but from my perspective, I am for equality for all in every aspect of our lives. I've talked about that frequently by pointing out how long it took for service clubs to allow women to join their ranks. On International Woman's Day, I discussed how even women can keep women down. It's inconceivable to me that as human beings we would want to keep anyone down for any reason. Last weekend, I finally went to the theater to see Django Unchained. I'm not a Quentin Tarantino fan, so I had put off seeing it longer than I would normally do for an award-winning film. I absolutely enjoyed the movie, even more than the other film that dealt with human rights last year, Lincoln. The movies shared the same message: for more than 150 years, black people, or African-Americans if you prefer, have struggled to be equal. Women suffrage movements began about the same time, yet today women and other minorities are still struggling for equality. Moving forward with gay marriage rights must happen now for it will still take years for it to be accepted by all. Proclaiming human rights through the judicial system is only part of the battle. The practice must become part of the mainstream culture as well. Service clubs should be part of the culture that leads the way. Service clubs must be intolerant of intolerance, and demonstrate that message by opening their doors to more diverse members, partners, and stakeholders. We know that our lives are richer when we broaden our circle of friends; and likewise, our community service will be more meaningful when we embrace and empower those who are different, yet still, just like us. Additionally, the district organizers have asked their members to wear their Optimist Club apparel to work today and to take extra time to talk about their Optimist Club's projects. The best way to increase awareness of the good that Optimist Clubs do is to talk about it. I think that's a lesson that we learned yesterday when when we discussed, "What's Your Story?" Of course, it might be uncomfortable for some to bring up the subject of their Optimist Club first. This passive promotion will hopefully encourage others to ask questions in order to learn more. If you are an Optimist Club member, please join us in the Proud to be an Optimist project. If you aren't a member, why don't you consider joining us? It's a good thing to do. Find a club near you now. As a public relations communicator, one of my favorite things to do is to tell stories. Many of those stories revolve around my volunteer passion: Optimist Clubs. I enjoy learning about and sharing the many different projects that Optimist Clubs perform in their communities around the world. The projects vary from spelling bees to sports programs and all the way to raising money to fund research at Johns Hopkins University to eradicate childhood cancer. Optimist Clubs take on big projects and they take on small tasks. They fill local needs and dream big dreams and most create a path to accomplish what means most to the people involved. But something is true no matter the size of the Optimist Club or the community; Optimist Clubs do not succeed in a vacuum. If club members and leaders are not talking about their projects, purpose and passion, nothing gets done. This phenomenon of telling stories about what we are doing in our Optimist Clubs is the foundation of word of mouth marketing. Your club projects should not be a secret and neither should your meetings. If people are to join us, they have to know more about what it means to be a part of the group. They need to know specifics like when and where the club meets and if there are expectations (like buying a meal) at the meetings. Most of all, they need to know the purposes of the organization and how they can help. We come to our organizations with many individual talents. We join because we see that our talents and interests align with the organization. We stay involved because we like the people that volunteer with us as work together to make a difference. We are emotionally rewarded with fellowship, friendship and the sense of accomplishment that comes from doing social good. Most people want all of those emotional rewards in their lives. Don't deny them the opportunity to join your Optimist Club. Tell your Optimist Club story to someone today, tell it again tomorrow, and the day after that. Your enthusiasm will inspire others to get involved and you'll share awareness of the great things that your Optimist Club does in your community every day. Friends, let me tell you, those are good stories to tell. Earlier this week I looked at attendance vs. membership issues in service clubs. One of the key points that stood out to me was that we, as service club leaders, have to be connected to our members. Whether we use email, text, Facebook or another social media tool, or that old fashioned medium known as the telephone, we have to communicate with them if we expect them to want to participate. How else will they know what is going on? In honor of that significant point, I've chosen, "Call Me," by Blondie as the Music Sunday video at Experience Optimism. It's a pretty simple message. Now go do it with your Optimist Club members. Now. At meetings of your service club, you regularly see 20 of your 40 members. Is that a good statistic or a poor statistic? I believe that if 50% of your membership participates, it is successful. Club meetings suffer from a lot of excuses; they are tough to get to, don't appeal to everyone, the meeting agenda is too busy or not busy enough, and the menu is unappealing are just some of the usual complaints. Lately, I've also heard a lot of this excuse: there is no time for networking. No, you can't appeal to everyone, but that doesn't mean that you and your club leadership shouldn't try. However, the conversation came to a rather abrupt halt when one participant wrote, "Good attendance starts with the selection of the potential new members. If they are unable or unwilling to attend the regular meetings and the club activities then you have a membership problem, not, an attendance problem!" Oh my. I couldn't disagree more. People join a group because they have an affinity for the cause or people involved in the cause. That doesn't mean that they will always, or for that matter, ever, participate. It's up to your club, and especially the new member sponsor, to help them become engaged. We have to take notice of the new member and treat them with special care because that "meeting stuff" is very likely not on their list of things to do because of the reasons mentioned above. That's an attendance issue. We have to take equal care with our existing members because at different times in their lives, the reasons mentioned as well as life events will take precedence in their lives. That's an attendance issue. So put the gimmicks aside, my friends. Make the meeting relevant, transparent, and time conscious and then add in a little fun and you'll find that your members want to attend. In fact, they won't want to miss, but when they do, they will still maintain their membership because they want to be associated with your club even when they can't participate. Optimist International is preparing for its 95th Annual International Convention. Optimist Clubs from around the world will converge on Cincinnati, Ohio's Duke Energy Convention Center on July 4-6, 2013 marking the second time that Cincinnati has hosted the group. 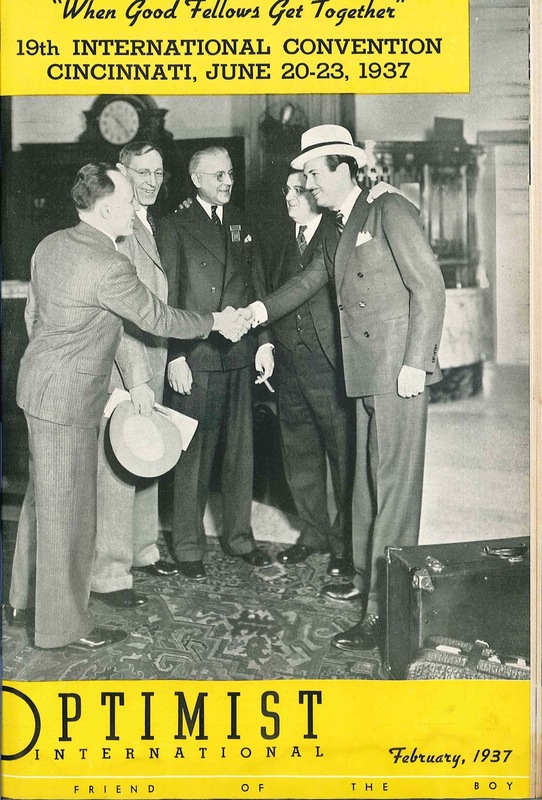 Optimist International shared this picture (right) on its Facebook page today, noting that the first time the organization gathered in Cincinnati was in 1937. I looked at the picture and almost typed out a snarky remark about the tagline, "When Good Fellows Get Together." But my optimism saved me and I continued to read down the page and discovered a more heartwarming picture from the Optimist Club of Gratiot County, Michigan. 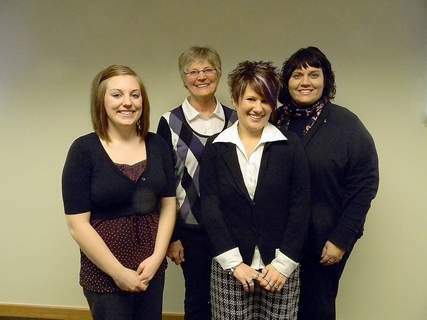 Their local newspaper shared a photo of 4 ladies that had just joined their club. What a difference 76 years makes! Whew! What a difference a positive attitude makes as well. I've decided to rephrase that tagline to "When good people get together." Hope you like it. Today's choice for Music Sunday at Experience Optimism is "Troublemaker" by Olly Murs, featuring Flo Rida. As Forrest Gump would say, I chose this video for no particular reason. Well perhaps that's not true. I liked the beat, and the artist, unknown to me until today, is pretty darn cute. Is that how we choose our music? Is that how we choose those we let into our lives? Are those who are cute and easy to listen to more apt to make friends than those who aren't? All are rhetorical questions for, to some degree, we know it's true. We like to be around those who make us smile and sometimes the first impression is the only amount of time that we get to make a connection. Optimists should have that first impression down pat. "Optimism, it's all in our name," should open doors to people who are ready to listen and ready to partake. Friends, it's your task to take the next step. Bring your smile, offer up some fun activities, and demonstrate that positive actions can make a difference. Follow these steps and you'll be adding new members to your Optimist Club in no time at all. And if and when your optimism wanes, and it will, perk up your day with a happy song. 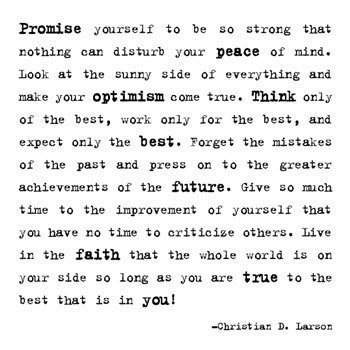 Sing along, smile and share it with others - share your optimism. Others need it as much as you. As part of the annual Youth Appreciation Celebration, the Optimist Club of Alamogordo, New Mexico welcomed the JOOI Club from the Academy del Sol to a meeting. 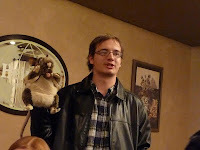 In return for their hospitality, the students entertained the group with puppets. That's right, puppets. The JOOI Club is developing a production that uses puppets as characters, "The Invasion of the White Sands Critters." The White Sands National Monument is approximately 16 miles from Alamagordo. It's pristine white sands make it a natural wonder. Even more so, according to the national parks website, there is no water source for animals that live on the White Sands. All of their water must come from the foods they eat and that makes me wonder, how do plants grow without water? There would be much to learn about this unusual habitat. Kudos to the JOOI students on their production. 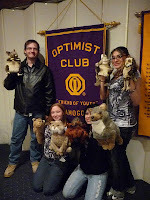 Thanks to the Optimist Club of Alamogordo for sharing their pictures with us. "Those who aren't volunteering, just probably haven't been asked yet," says Tahna Cooper, executive director of the CASA program in Twin Falls, Idaho. In this video Cooper explains how volunteers make time to give one-on-one support to children through the Court Appointed Special Advocate Program and comes to that conclusion based on the feeling one gets in service to others. It is fulfilling to give of oneself in service to others. It makes our communities better places to live. Barry Knoblich is also highlighted in this video. 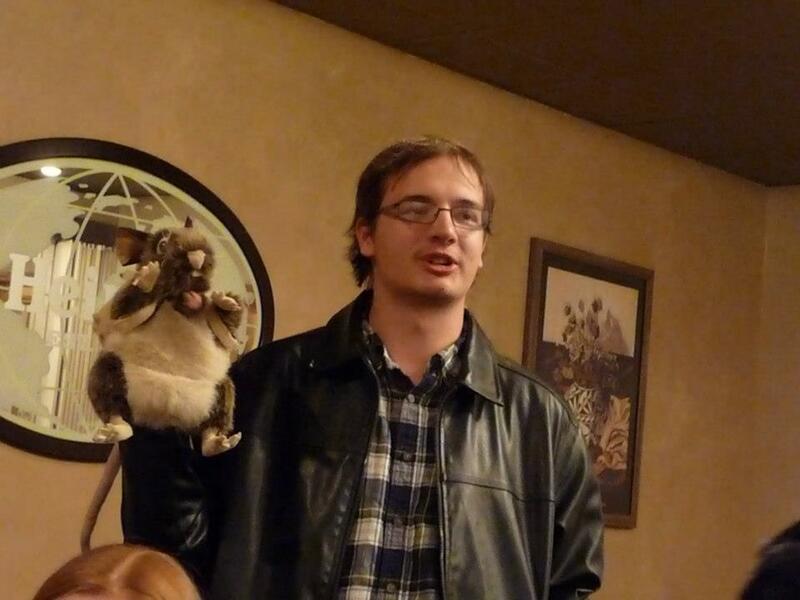 As the membership chair for the Twin Falls Optimist Club, he explains that service is fun. Over the past three years, the Twin Falls Optimist Club has grown by 50 members, and now 125 (and still growing), the club has donated more than $30,000 to a school track fund, and made many other contributions of money and time to a number of worthwhile projects that may not have happened without the club's support. The Optimist Club understands that if a project is not fun, a volunteer might not stay around long enough to feel the fulfillment that service brings. Twin Falls, Idaho is blossoming from the attention of its community volunteers. Your city can too. Get involved - one way to do that is to start an Optimist Club. Ask me how. DoSomething.org, the organization whose mission is to introduce young people to community service and to empower them to lead with their creative ideas, recently asked its followers what they do to save money on food. They received a number of creative answers, and one of was, "Join a club because they have free snacks." 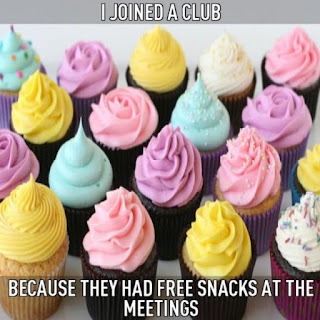 One might be left to wonder if that is really true; do young people join clubs for free food? I know from experience that I get more volunteers to show up when I offer free pizza. What does that mean for membership associations, especially those traditional-model service clubs that meet over meals? I think it means that a young person is not likely to join because they are saving money. Reminder to those who want to question what young people are saving money for: it doesn't matter because it is their money to be used on their priorities. But aside from the humor that I find in this anecdote, I have to say that I am also concerned. Some of the other money saving strategies were "Stock up on free condiments," and "I buy a hamburger, eat half of it and then complain that it wasn't good enough and I get my money back." Both of these tactics indicate a lack of ethics. 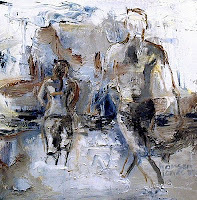 While these particular money-savers might need the good values offered by a service club, I posit that they are not likely to have the moral persuasion to join and give of themselves in service because they have indicated a personality that takes what is not rightfully theirs. Service clubs are always on the lookout for younger members. I'm happy to say that this humorous story offered some hope. Among the good ideas were, "Eat only what is in the house," "Stop buying name brands," and "Cook instead of eating out." Well what do you know, maybe there is hope for the millennial generation after all. Is it desperation or optimism? "If you're lost and alone or sinking like a stone, carry on. May your past be the sound of your feet upon the ground, carry on." It's a rather desperate song with an optimistic refrain that caught my attention this week, but it wasn't the lyrics that drew me in. It was the music, melodious and triumphant. "Carry On," by Fun starts out with a slow piano lead-in and the lyrics tell a sad story of life throughout, but then the drum comes up and lets the listener know that all will be okay in the end because we move forward. We carry on. Optimists rejoice. This song is about what you do every day. Carry on. Since yesterday was International Women's Day, I'm a day late with this thought, but it doesn't matter; it's important that this suggestion take place every day and not just once a year. Today is the day for fathers and mothers to call their daughters and ask them to join an Optimist Club. I wanted to join the Optimist Club of Granite City, Illinois long before the Optimist Club wanted a woman to join. Year after year, during their membership drive, they would visit my dad and ask him to join. His response was always, "No, but Linda would like to." They always said that they would get back to us on that. It took about five years for them to finally get back to us. Membership in all service clubs was declining by that time, but that didn't matter to me. I came with enthusiasm, and after a few years in the club was asked to be its president. We increased membership by five members that year and progressively made increases each year after that until I moved to another community. This story isn't about me. It is about what an enthusiastic member can bring to a struggling club and how those enthusiastic members are often just waiting for the chance to be recognized. Women are overlooked in service clubs, the workplace, and other settings for a variety of reasons. Some often consider service clubs to be "old boys clubs" and perhaps there is a little truth in that stereotype, but as International Women's Day points out, the inequality between men and women is pervasive throughout our societies. But it doesn't have to be. Women need sponsors to help them find a level playing ground. That sponsor might be another woman who's made it, or not; or a progressive male colleague. And as much as we might wish we could make it on our own, the sponsor might even turn out to be a parent who helps their child - their female child - make the right connections. I think one of the right connections is a service club. So do it. Ask your daughter to join an Optimist Club today. One of my favorite quotes comes from Oprah Winfrey: “The more you praise and celebrate your life, the more there is to celebrate.” I had to reflect on this quote today as I considered what I wanted to say to recognize the 102nd anniversary of International Women’s Day. For our emotional well-being, I believe that we must celebrate positive actions and recognize the good in ourselves and surroundings. However, I’m not so certain that we should celebrate women during International Women’s Day. Isn’t the purpose of the event to bring awareness to inequality, oppression, and even abuse of women in the workplace, and other settings, by cultures around the world? We cannot celebrate such actions and therefore, the thought of celebrating International Women’s Day does not set well with me. We can, however, bring attention to strong women who have lifted themselves up and inspired others to do the same. Today, CNN published a slideshow of inspirational quotes from women. It’s a good selection, and I chose Nora Ephron’s quote, “Above all, be the heroine of your life, not the victim” as my favorite. I believe this quote subtly identifies a problem. Women do not always realize they are victims. Some women might think that earning 77% of a man’s salary is acceptable because they have made trade-offs in their lives such as marriage or family that keeps them from being equal. Some cultures make women victims by denying them education. It’s not easy to recognize you are victimized when such behavior is all that you know. Some women, recognizing that they have been victimized by inequality become victims of violence as they request or stand up for their needs. And sadly, in some cultures, women are abused simply to keep them down. So while I don’t think these are things to celebrate, they are things to bring to light. International Women’s Day provides a forum for awareness of the struggles that women face on a daily basis. To those who are reading, I encourage you; let’s keep the solemnity of the day in mind. Women are remarkable and we should celebrate their accomplishments daily, but at least one day a year, we should unite to say not all things are equal and draw attention to actionable plans that will change the status quo. In Fulton, Missouri, 17 middle school students recently participated in a speech contest to explain "Why My Voice is Important." It was unique because these students represented the Missouri School for the Deaf. Their voice was their hands. Jennifer Dignan, Chair of the Communication Contest for the Deaf and Hard of Hearing (CCDHH) and a teacher at the Missouri School for the Deaf explained that at first, she was taken aback by the topic, but upon reflection, she realized it was perfect. "We do have a voice, but its a different kind, so I had to make sure my students understood," she said. Responding to concern raised by some clubs, Optimist International modified the topic for CCDHH students to be "Why My Opinions are Important;" however, the original topic remains acceptable. Dignan explained further, "When I first told them they said, 'my voice? That doesn't apply to us,' but I explained it's how you express your thoughts, your feelings, and make yourself heard, and they really got that." As hearing persons, we sometimes forget how slight wording can make all the difference in how something is perceived by the deaf community. I applaud Ms. Dignan for using this opportunity to help her students learn that a voice can be heard in many ways. Photo courtesy of the Fulton Optimist Club. From left, Elizabeth Harrison, first place; Tyra Rogers, second place; Cheyenne Dickerson, third place; and Pat Brauner with the Optimist Club. 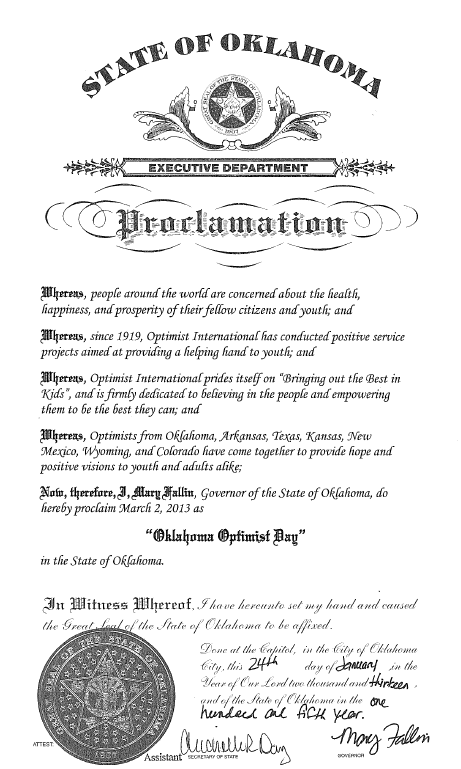 March 2, 2013 was officially declared Oklahoma Optimist Day by Governor Mary Fallin. This auspicious event coincided with the Southwest Parallel District Conference held in the Southwest that included Optimist Clubs from South Texas, New Mexico/West Texas, Colorado/Wyoming, Arkansas, Kansas, North Texas and Oklahoma. The leadership activity was open to all members and included lectures on new club building, membership, social media, fundraising and governance. The keynote presentation was given by Sean Kouplen about finding fulfillment and clarity in one's life. 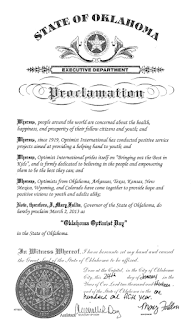 Have you ever wondered what does a gubernatorial proclamation mean to an organization? It means awareness on many levels, but most important, I think, is it means that someone cares enough to share the mission of the organization with influential citizens who bring added recognition to the cause. 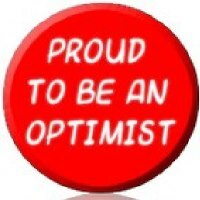 Perhaps every day should be Optimist Day somewhere. Everywhere. I'm not sure what it is about an Easter Egg Hunt that brings out the kid in all of us. Maybe it's the candy or maybe it's the memories, but Optimist Clubs around the the US can be seen this time of year getting ready for the big search. There will be candy, prizes, and the Easter Bunny himself right along with the most breathtaking three minutes of action as the kiddos scramble for the golden eggs. The Optimist Club of Blair, Nebraska's Easter Egg Hunt flyer is shared here because it caught my eye this morning on Facebook. It's easy to read, the sponsors are easily identifiable, and most of all, for me, it looks hoppy. Oh, I'm sorry, I mean happy. It looks like spring is on the way. Optimist International has reintroduced its $30 under 30 membership recruitment campaign. It's meant to introduce the Millennial Generation to an Optimist Club by offering them a reduced membership fee for one year. 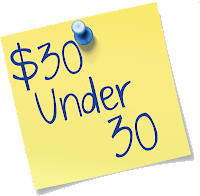 Those under 30 years of age can join from now until September 30, 2013 for just $30. I like this program; really I do. However, I'm torn for two reasons. I don't think it goes far enough and I think it goes too far. Let me explain. The program does not go far enough because it is a temporary program. Introduced last year at about the same time, the first program ran until September 30, 2012 at which time, everyone resumed the regular membership rates. Now for five months, Optimist Clubs have been without this recruiting tool. If they were successful at recruiting members under 30 years of age, they and their new member were penalized by paying a higher rate. That's not a positive message to send and next year, clubs are likely to wait for the $30 under 30 incentive to return so that they can save money. An organization should never encourage its members to wait to invite others to join. That's one of the reasons that I am not a fan of offering incentives. Membership is a year-round responsibility and privilege, not something that is dictated by prizes. I also believe that this program goes too far in its focus on young adults. Regular readers know that I believe that in service, age is not the relevant factor. As a whole, our society is getting older. The Baby Boomers are retiring in droves and suddenly, older individuals have more time to volunteer. Where is their incentive to join? Why can't they try out an Optimist Club for $30? Optimist International should empower its Optimist Clubs to promote membership to all ages and I question that reducing dues for some is the right approach. It sends a bad signal to those who aren't lucky enough to qualify for the discount and puts the focus of membership on money over service. I belong to an Optimist Club because I believe in the service it provides the community. I help start new Optimist Clubs because I believe in their potential to do good things in their local communities. When there is commitment to a cause, the money becomes incidental; we can always find a way. No matter your age, please click here if you would like to find an Optimist Club in your community.